The first trailer for Peyton Reed's Ant-Man gave us some rather epic looks at Paul Rudd as the titular shrinking superhero - but now Marvel Studios is finally ready to reveal the film's villain. 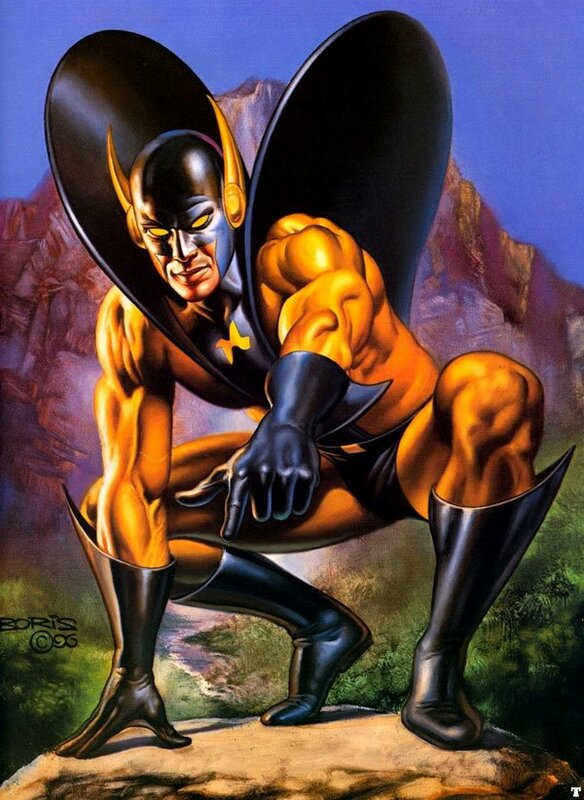 Check out our first real peek at Corey Stoll as Yellowjacket below! This debut official look at Ant-Man's central antagonist comes to us from Entertainment Weekly, and it is rather badass. In addition to having an insect-like mask that actually looks pretty damn freaky, those arms outfitted with plasma cannons that he is wearing on his back look extremely dangerous. And much like Paul Rudd's character, Scott Lang, this suit can also shrink, which means that the miniscule hero probably won't have the easiest time taking down his primary foe. It's noted in the piece that weaponry does give Yellowjacket a bit of an edge, as guns were not built into the suit designed by Hank Pym (Michael Douglas), but director Peyton Reed does mention that Scott has a few aces up his sleeve as well. Part of this is the increased strength the protagonist has when he has shrunk himself down, but he also has his ability to talk with ants - which evidently comes in handy multiple times throughout the movie. Underneath the awesome piece of armor pictured above in Ant-Man will be Darren Cross, who has been previously described as a a former protege of Hank Pym's, who winds up taking over his mentor's company. It's this action that leads Hank to enlist the help of Scott Lang, as he is hoping to orchestrate a heist that will help him get back a key piece of technology that he doesn't want in Cross' hands. The end result should be a Marvel Studios film unlike anything we've ever seen before, and we couldn't be more excited for both the mission and final showdown between superhero and supervillain. But what do you think of the suit? Are you excited to see it in action, or do you wish that Marvel had gone in a different direction with the design? We want to know what you think, so spill your thoughts in the comments section below!